We’ve all seen guide dogs that can direct blind people around obstacles and tell them when it is safe to cross the street. Perhaps you also know of guide dogs for the deaf, which can alert people to a ringing phone, a doorbell or a smoke alarm, or dogs that can warn people with epilepsy of an incipient seizure, giving them time to get to a safe place before they lose consciousness. Dr. Marty Becker, veterinarian and author (with Danelle Morton) of “The Healing Power of Pets” (Hyperion, 2002), tells of a golden retriever named Dakota, who was able to warn his master, Mike Lingenfelter, that a heart attack was imminent and alert Mr. Lingenfelter to the need to leave a stressful situation and take preventive medication. In recent decades, there have been countless such stories of animals helping to improve and even preserve the lives of children and adults with all manner of diseases and disabilities. Trained dogs are being used to help keep children with autism safe and to break the “freeze” that can afflict people with Parkinson’s disease when they try to walk. And dogs, cats, bunnies and birds are often brought to schools and institutions, as well as to hospitals and nursing homes, where they help to relax and inspire residents and distract patients from their health problems. But the use of animals to enhance health can go well beyond individual cases and group settings. A growing number of psychotherapists are using therapy animals to facilitate treatment, especially treatment of children with emotional, social and even physical problems. Among the pioneers is Aubrey H. Fine, psychotherapist and professor at the California State Polytechnic University in Pomona, whose extensive successful use of therapy animals in treating children is documented in “The Handbook on Animal Assisted Therapy” (Elsevier/Academic Press, 2010). As Dr. Fine describes one of his first and most inspiring cases, 5-year-old Diane was brought to him because she recoiled in fright from strangers, and though she spoke at home, she refused to speak to anyone else, including her kindergarten teacher. 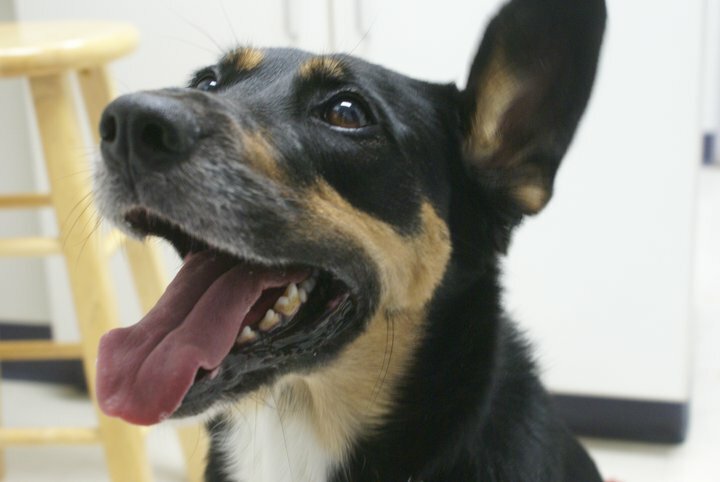 A trained therapy dog named Puppy eventually broke the back of her selective mutism. Diane was petting Puppy, smiling and content, when Dr. Fine gave the dog a signal to walk away. Diane was crestfallen, and seeing the girl’s distress, Dr. Fine told her that all she had to do to get the dog back was to say, “Puppy, come.” Softly, the child said, “Puppy, come, please come, Puppy.” That incident became the bridge Dr. Fine needed to help the child overcome her socially disabling problem. He tells of another troubled child who finally began to speak about being physically abused when Dr. Fine told him that the misshapen therapy animal he was playing with had been rescued from an abusive home where it had been seriously injured. In another case in which a child was told where — and where not — to touch the therapy animal, the child opened up about being inappropriately touched, sexually abused, by a family member. “Children are more likely to reveal inner thoughts to the therapist because the animal is right next to them and helps them express themselves,” Dr. Fine said in an interview. In early work in a social skills program for hyperactive children, Dr. Fine found that they could be more easily taught how to behave calmly if allowed to handle his pet gerbil. “I realized this approach can have a tremendous impact in teaching because it helps to change how we relate to other beings,” he said. Although the field of animal-assisted therapy has grown a lot in the last four decades, experts readily acknowledge that it suffers from a lack of well-designed research that can establish guidelines for safety and effectiveness in various situations. For example, although using dolphins to treat autistic children has received considerable media attention, at least two studies found no evidence of benefit and considerable risk of harm to the animals and to the children, said James A. Griffin of the National Institute of Child Health and Human Development. The International Association of Human-Animal Interaction Organizations insists that members limit service and therapy animals to domestic species trained for the job. And the Delta Society, which provides training programs for the animals, will not certify wild or exotic animals like snakes, ferrets, lizards and wolf-hybrids. However, the Delta Society says it “is constantly expanding the range of species included in the Pet Partners program” when there is adequate research to document the safety of their use. The effects of therapeutic horseback riding on children and adolescents with autism. If safe and effective, riding is less invasive than medications used to treat common symptoms like irritability and hyperactivity. A large epidemiological study to document the overall public health effects on children and adolescents of living with dogs and cats. A study to determine whether therapy animals can help children with behavior disturbances attributed to attention deficit hyperactivity disorder develop better self-regulation, self-esteem and social behavior. Studies using survey and genetic tools to help select the most effective cats or cat breeds to work with autistic children. Dr. Griffin acknowledged in an interview how difficult it can be to design a scientifically valid study using animals because “it can’t be a blind study — you know if the patient has a therapy dog.” But he described one recent study in which the patient, a young boy with autism, served as his own control. When he was with the therapy dog, levels of the stress hormone cortisol in the child dropped; the levels rose when the dog was taken away, and dropped again when the dog was returned. The next step would be to coordinate biochemical changes with behavioral effects — is the child calmer and easier to handle when with a therapy animal? 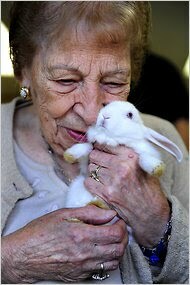 This entry was posted in Delta Society, Therapy animals on August 31, 2011 by yourfriends. Gigi is a one year old chihuahua mix that was just recently adopted by Eileen. Gigi was rescued from a shelter in Kentucky and had made several trips with her rescue group to Maryland to an adoption show but no one adopted her,luckily for Eileen 🙂 The minute Eileen met her she knew this was the dog for her! She is very sweet and outgoing and happy to meet everyone, so please if you see her in the office stop and say hello. She would just love it. This entry was posted in GiGi, rescue on August 28, 2011 by yourfriends. Hypoallergenic dogs? 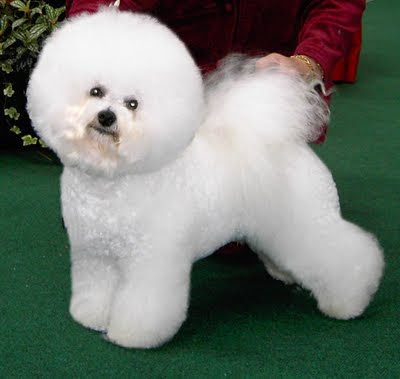 Despite many claims, we have always questioned if they truly exist (just ask the folks at Bichon Rescue how many “hypoallergenic” dogs they rescue.) Now a study in the Journal of Rhinology and Allergy suggests that there may be no hypoallergenic canine. This entry was posted in hypoallergenic on August 24, 2011 by yourfriends. 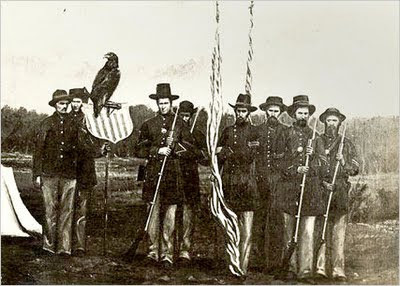 In honor of the 150th anniversary of the start of the Civil War, we thought you might like to read this great article telling about the dogs (and eagles!) that served as mascots for the troops heading off to the war. There is even an accompanying slide show. This entry was posted in civil war, Mascots on August 21, 2011 by yourfriends. 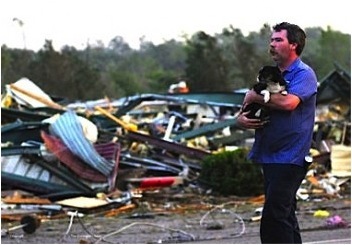 “After the deadly storms that ripped through Alabama and the rest of the deep south on Wednesday, both people and pets are trying to recover and get their bearings. Global Animal Foundation is collecting donations on behalf of vetted animal rescue groups in Alabama that are on the ground working to shelter, feed, rehabilitate and reunite pets with their guardians. Global Animal Foundation is collecting donations for the “Have a Heart Animal Rescue and Adoption” and other rescues working on the ground to help with medical costs for injured animals, boarding and food, as well as helping reunite pets with their families. This entry was posted in Alabama, Donations, Tornado on August 17, 2011 by yourfriends. 10. The average shark lives to be 25 years old, but some can get as old as 100! They live so long because their chances of contracting a disease are low. Their skeleton is made up entirely of cartilage, which drastically lowers the likelihood of developing a tumor and strengthens their immunity. 9. Modern sharks breathe by ram ventilation, a process that forces water into their mouths and then processes it as they swim forward. When they’re idle, sharks use muscles around the mouth to pull water in and over their gills. Sharks that don’t have muscles strong enough to do the job must take shorter and less frequent rest stops. 8. 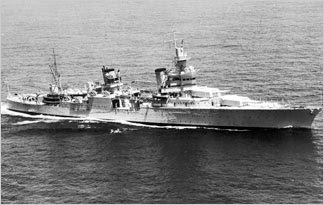 One of the worst shark attacks in history was the sinking of the USS Indianapolis during World War II. Nearly 900 sailors were stranded in the Philippine Sea near Guam for four days. Experts can’t be sure how many sailors lost their lives to sharks, but when help arrived, only 316 people were still alive. 7. A shark’s tooth-shaped scales, called denticles, allow it to move swiftly through the water without collecting barnacles and algae deposits on the skin. In 2005, engineers successfully mimicked the pattern of scales, creating a bacteria-resistant coating. 6. It’s a shark-eat-shark world … sometimes even before the sharks are born. When some species’ embryos begin to develop teeth, they eat their unborn brothers and sisters until one shark remains, an act known as intrauterine cannibalism. 5. Sharks respond to a sound known as a “yummy hum.” It’s not an actual hum, though. It’s an infrasonic sound (one that’s too low for humans to hear) that injured fish make, drawing sharks to an easy meal. 4. Almost 50 different species of sharks have light-emitting organs called photospheres. Sharks use the light that comes from these organs for camouflage and to attract mates. 3. Every once in a while, a female shark can reproduce without any contact from a male, an act known as parthenogenesis. Scientists have only documented a couple of cases of parthenogenesis, but some suspect that just about any female shark can get pregnant on her own in the right circumstances. 2. Sharks living in frigid waters can heat their eyes using a special organ next to a muscle in their eye socket. This ability enables them to keep hunting their prey in extreme temperatures. 1. “Jumping the shark” is the kiss of death when it hits our favorite sitcom, but it’s just as deadly in the real world. Great white sharks off the coast of Seal Island, Africa, are known to jump almost 10 feet (3 meters) in the air to catch unsuspecting seals … or anything else, for that matter. This entry was posted in sharks on August 14, 2011 by yourfriends. Come join Linganore Winecellars-Berrywine Plantation, Maryland’s premier vineyard and winery and spend a relaxing afternoon with or without your dog(s) while enjoying some of Maryland’s finest wines. Partake in wine tastings, enjoy live entertainment, silent auctions, door prizes, pet and wine themed vendors and exhibitors, food, and plenty of discounts on wine. For those who bring their furry friends along, participate in activities and contests, pet photo sessions by Fuzzy Pants Photography, and wading pools for the pooches. 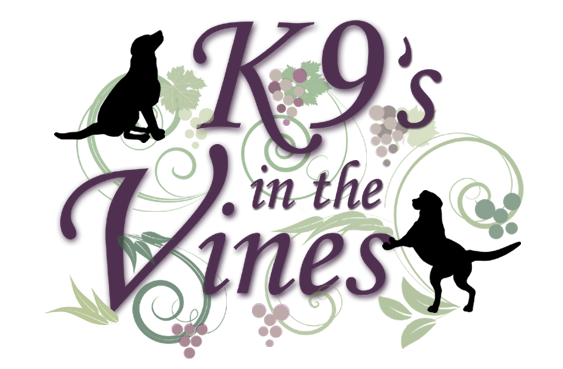 K9’s in the Vines is made possible only through the support of our many sponsors. We extend our gratitude for their support. It is not too late to be a sponsor and/or vendor for this event. If interested, please contact Stephanie at sgadzinski@hotmail.com . The deadline for sponsorship is July 21, 2011. This entry was posted in Linganore Winecellars, Wine tasting on August 10, 2011 by yourfriends. This is Lilly, a 2 year old female mixed breed who has a very inspirational story. Her current owner, who was pregnant at the time, found her in Baltimore, MD severely beaten and left for dead on the side of the road. She saved her life. She has now had Lilly for about 2 years and she is a very happy pup. Lilly shows no signs of her past other than an adorable lopsided ear. She is definitely a fighter at heart and is lucky to have found herself in a great situation now with such caring owners! We thank them for saving her! This entry was posted in Lilly, rescue on August 7, 2011 by yourfriends. WHAT IS IT? : a fun, easy way to help raise money for the Frederick County Humane Society by eating at participating area restaurants! You must present the special Add-A-Bite certificate (link located further down in this email and on our website) at the restaurant in order for us to enjoy the benefit of your participation. Feel free to make multiple copies! August at several other restaurants. Saturday is also the Dog Days of Summer in downtown Frederick and we hope you will join us for this fun doggy evening! Five Guys: from 11 a.m. to 9 p.m. Aug. 6, diners are encouraged to drop their food receipt in one of the FCHS collection boxes located there. Five Guys will donate 10 percent of the receipt totals in those boxes to our organization! Note: You DO NOT present your certificate to Five Guys; they will use your meal receipt from that day to calculate the donation to us. Please print off the Add-A-Bite certificate and bring it with you, to present at one of the participating restaurants when placing your order. The only exception is Five Guys, which is using the meal receipts from Aug. 6, not the certificate. You can make copies of the certificate and use it as many times, and at as many of the restaurants, as you like! Please share with family, coworkers and friends too! Thank you!! Questions or comments? Please contact Brigitte Farrell at director@fchs.org. Many thanks for your support!! Please thank the participating restaurants for their support too! This entry was posted in FCHS, fundraiser on August 4, 2011 by yourfriends. Meet Lilly Sophia! The new addition to Stacey’s family. You may see her around the hospital for socialization. Feel free to give her a treat! This entry was posted in Chihuahua, Lilly on August 3, 2011 by yourfriends.